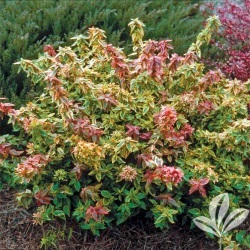 This evergreen variety of abelia is low and compact with bright yellow variegated foliage displaying white flowers in the summer. Excellent choice for containers. Attracts butterflies. Can tolerate seacoast conditions. 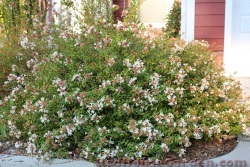 This evergreen abelia blooms white in late spring. Ideal for a foundation planting for under windows. 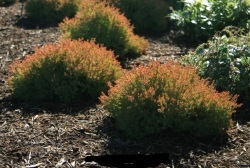 Glossy green foliage turns orange in fall. Flowering almond is a beautiful small shrub that is covered in double pink blooms in the spring, with a light almond scent. 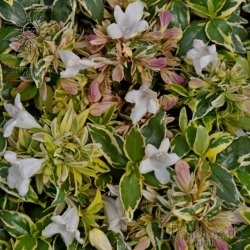 A very desirable spring flowering shrub that is perfect for any landscape. Absolutely stunning in a patio container. 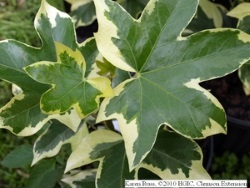 Leaves, shaped like a Sweet Gum leaf, are green with a creamy white border. This evergreen vine has a slow growth habit and makes a nice accent in a shade garden. 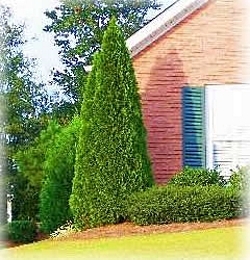 Narrow, pyramidal evergreen displaying dense emerald green foliage. 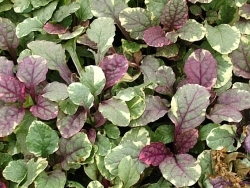 Holds its foliage color throughout winter. 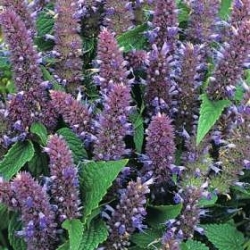 Excellent medium to large hedge or screening plant. 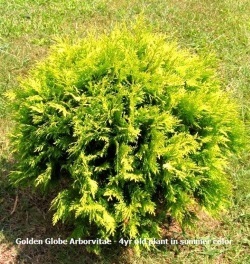 Nearly perfectly globe shaped,this shrub has finely textured, bright golden spring foliage and beautiful deep red fall color. 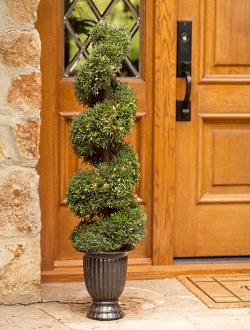 No pruning is necessary to maintain its compact, rounded form. 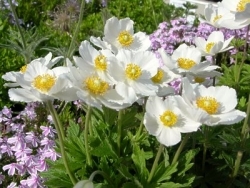 Perfect for foundation planting, as a rock garden specimen, or massed in the landscape. Evergreen. 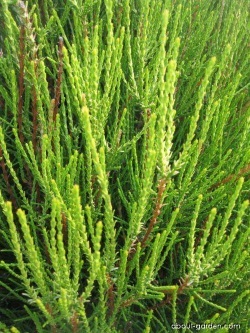 Bright golden-yellow foliage makes a striking, low evergreen hedge. Tolerates wet soil and seacoast exposure. Very adaptable and is cold hardy.